I have been skeptical about the mass market potential of wrist-worn wearables ever since Google unveiled Android Wear in 2014. Since then, we have seen a number of high profile smartwatch launches, including the Apple Watch and the recent Fitbit Blaze (which was greeted with an 18% decline in FitBit's stock price). However, the hunt for a killer app continues and I have yet to come across a relevant use case for mass market users. Benchmarking the current state of this product category has been challenging because of the complete lack of reliable, public data. Luckily, Accenture recently released some data that could ease our way. Only 48% of consumers plan to buy a smartphone in the next 12 months, down 6 points from last year. The drop was particularly stark in China, where it went from 82% last year to only 61% this year. Of those who don't plan to buy a new one, 47% said the main reason was because their current phone was good enough. Similarly, the survey showed an eight-point drop in purchase intent for tablets, and a six-point drop for laptops. Overall, only 13% expected to spend more on smartphones, tablets, and laptops this year than last year. That's compared with 33% who said they were planning to spend more in 2014 than 2013. Most worryingly, interest in wearables and connected devices was flat from last year, and purchase intent is relatively low. 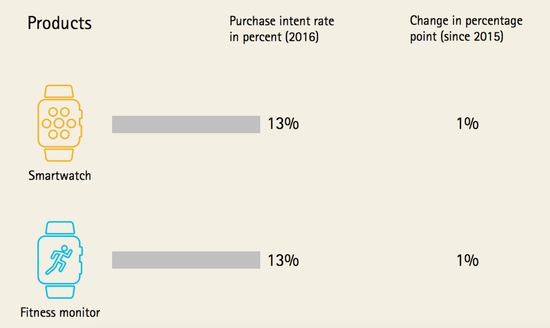 Unsurprisingly, "good enough" smartphones have had a noticeable impact on upgrade intent. This was something I pointed out two years ago, but in hindsight I called it too early back when industry-wide smartphone screen sizes were still not "good enough". The more interesting takeaway to me is that purchase intent for smartwatches and fitness trackers has not increased despite the high profile product launches, massive ad campaigns and expanded distribution we saw in 2015. With wearable shipments growing sequentially (from an admittedly small base), shouldn't we expect word-of-mouth to have some sort of impact on purchase intent? Thanks to Endeavour Partners research from mid-2015 (already dated by now), we know that smartwatch abandonment rates continue to be high and this is a key metric to watch. The lack of an obvious value proposition for mass market consumers is a clear drawback and appears to be dampening word-of-mouth. Of course, this data is more backward looking than it appears (as most consumer surveys are). Purchase intent is a function of the value communicated by a product, based on existing capabilities. New capabilities unforeseen by consumers can have a dramatic impact on these responses. But new capabilities are largely a function of app innovation, which has been hampered without access to new contexts or input models. This is why I have largely based my skepticism not on current smartwatch iterations, but on what they can become in the future.